At this point, it seems fairly clear that residential solar power is here to stay in Australia. Over 2 million homes already have a solar PV system, and there is now more than one panel installed per human being in the country. Virtually all industry analysts and investment houses – both within and outside Australia – are predicting that solar (and battery storage) are the future. The chart below offers a glimpse into how average prices have changed since 2012. Systems cost about 50% less to install in February 2019 than they did in August 2012, according to the data that we’ve been keeping track of. Generally speaking, it’s important for homes to choose a solar system sized appropriately for their situation – meaning that they can use at least 30% of the energy it produces directly. However, if they can use even more (e.g. 50%), then the business case gets even better. According to our data, with a self-consumption rate of 30%, payback times for 5kW solar systems are under 6 years on average, nationally; in Adelaide, Brisbane, Darwin, Perth and Sydney they’re easily under six years, as per the table below. The internal rate of return (IRR – a metric for comparing investments similar to ROI but more comprehensive) for a solar system in each city is easily over 15% – on average 18% but as high as 32% in Adelaide. In 2019, solar power systems remain affordable and attractive, especially in light of the plague of high electricity prices. Solar feed-in rates may be not be spectacular, but with system prices as low as they are it’s not difficult to see favourable returns from putting solar on your roof, particularly if you shop around and manage to find a good deal. Furthermore, making efforts to increase your rate of direct solar energy consumption (e.g. with a home energy management system) will also help to maximise returns. In places where low system installation prices collide with high electricity prices, solar makes spectacularly good sense without much effort. 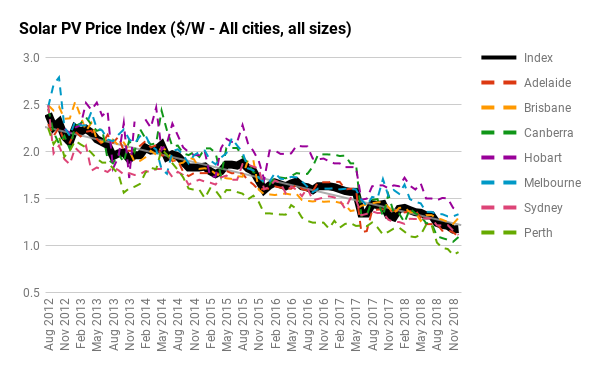 But even in cities with higher average system prices put payback periods over 6 years in our examples, it doesn’t take much to improve the financial case. We recommend shopping around for the best deal possible and ensure that you can use the solar energy that your system will produce.